The North Vietnam is known for its alpine peaks, the Red River Delta, enchanting Halong Bay and historic Hanoi as well as for the diversity of its ethno linguistic minorities. Joining this trip, you can discover all the beauty of this area’s culture, landscape and local people. It is also a valuable journey for picture-hunting travelers. Upon arrival at Hanoi’s Noi Bai Airport, our guide and driver will welcome you and transfer you to your hotel. Hanoi is sometimes called the Paris of the Orient, with shaded boulevards, verdant parks and ochre buildings that retain an old-world charm. You are free to stroll around the city and catch a first glimpse of this peaceful city. In the evening, a dinner out to taste local authentic Vietnamese Cuisine and visit one of the water-puppet theatres to enjoy a performance of this fantastic art form - unique to Vietnam and best seen in Hanoi. At 8.30am, start the day with a visit to Ho Chi Minh’s Mausoleum and “House on stilt” at the same area with the Presidential Palace and the famous One Pillar Pagoda. We also make a visit to the Temple of Literature – the first university of Vietnam, which is now dedicated to Confucian worship. 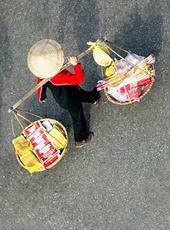 There is time to visit Hanoi Old Quarter and Hoan Kiem Lake with a stop over at Ngoc Son Temple. Rest of the time, you can explore further on your own. You could stroll around the French quarter where many of the embassies are located. Or take a shopping expedition in the Old Quarter or just relax at one of the many parks and lakes that make Hanoi one of the greenest cities in Asia. Departing from your hotel at 8am, we will take a 2.5 hour road trip to the countryside out of Hanoi, Reaching Yen dock, then we will enjoy one hour on a small sampan in Yen River surrounded by the spectacular scenery of mountains, rivers and rice paddies. We will pass by Trinh Pagoda and continue to Thien Tru Habour where we will start trekking to main cave pagoda uphill- Perfume Pagoda. The visit to this pagoda will give us more understanding of the Buddhism in Viet Nam. Today we will have late and simple lunch near Thien Tru Habour before a visit to the most beautiful Thien Tru Pagoda. Enjoy one hour sampan back to meet our waiting vehicle. We get on car and arrive in Hanoi around 6 pm. Few hours free to enjoy dinner and take some refreshment. At 8.30pm, we will take an overnight train to Lao Cai. Arrive in the early morning (around 6am), you will take a 45 –minute drive to Sapa, a remote land littered by a patchwork of diversely rich cultures of ethic groups. Check in hotel for your refreshment and breakfast. In the afternoon, commence the trip again with a walking down to the H’mong village of Cat Cat. In Cat Cat, you can see the waterfall, the old French hydro power station and have a chance to communicate with local minority people. After Cat Cat, we drive out to Ta Phin Village of the Red Dao, which is in a picturesque valley. Enjoy a day of trekking through local villages, departing after breakfast to Lao Chai village, home to the Black H’mong Tribe and then on to Ta Van, the only village of the Giay minority. After lunch continue your walk through bamboo forests to Giang Ta Chai, visiting a Red Dao minority village. Return to your Sapa hotel to freshen up and transfer to Lao Cai for your overnight train journey back to Hanoi. Arrive in Hanoi in the early morning, our guide will transfer you back to your hotel for relaxation before getting on car for Halong Bay journey at 9am. It takes you about 3 hours to reach there. Then you will have a cruise on a traditional Vietnamese wooden Junk on Halong Bay to most caves, have seafood on board for lunch and have pleasure time for swimming and sunbathing. You will have dinner on board as enjoying the sunset; then stay on board for overnight. This day you will have further cruise on the bay, visit rock piles and sun bathing before getting back to the wharf in the early afternoon. Our waiting vehicle will transfer you back to Hanoi. Some free time for shopping or strolling around the city until transfer time to the airport for your flight to the next destination. End of services by Indochina Travel Service.